[Transcript] Real change also means getting rid of the corruption in Washington. As you have heard, it was just announced yesterday that the FBI is reopening their investigation into the criminal and illegal conduct of Hillary Clinton. This is the biggest political scandal since Watergate, and it is everybody’s deepest hope that justice, at last, can be delivered. Hillary has nobody but herself to blame for her mounting legal troubles. Her criminal action was willful, deliberate, intentional and purposeful. Hillary set-up an illegal server for the obvious purpose of shielding her criminal conduct from public disclosure. She set-up this illegal server knowing full well that her actions put our national security at risk, and put the safety and security of your children at risk. To further cover-up her crimes, she bleached and deleted 33,000 emails after a Congressional Subpoena, made 13 phones disappear – some with a hammer, lied to Congress under oath, lied to the FBI, and then two boxes of email evidence went mysteriously missing. She even pretended not to know that the letter “C” meant confidential information that was classified. As the recent release of a memo from one of Bill Clinton’s closest associates demonstrates, the Clintons have turned the government into a scheme for personal profit. The Clintons even saw the deadly disaster in Haiti as an opportunity to cash-in. The WikiLeaks revelations have revealed a degree of corruption at the highest levels of our government like nothing we’ve ever seen before – including a candidate who boasts to donors about having a public position for the voters, and a private position for Wall Street. Hillary put the office of Secretary of State up for sale and, if she ever got the chance, she’d put the Oval Office up for sale too. Hillary should have been convicted long ago. That the legal process has been taking this long is incredible. And now it’s reported that the Department of Justice is fighting the FBI – that’s because the Department of Justice is trying to protect her. 97% of Department of Justice employees’ presidential contributions went to Hillary Clinton. There are those, and I happen to be one of them, who think Hillary offered Lorretta Lynch a reappointment as Attorney General. Perhaps that was what Bill Clinton was doing in the secret meeting on the tarmac in Arizona. He said it was to play golf, but he never played, and it was over 100 degrees. This is what we mean when we call it a rigged system. Now the Attorney General is fighting the FBI for doing what was right – but what should have been done many months ago. Perhaps, through this other investigation, they found what may be some of the 33,000 missing and deleted emails Hillary tried desperately to destroy, even going so far as to use digital bleach. The stakes on November 8th could not be higher. A vote for Hillary is vote a to surrender our government to public corruption, graft and cronyism that threatens the very foundations of our Constitutional system. What makes us exceptional is that we are a nation of laws, and that we are all equal under those laws – Hillary’s corruption shreds that foundational principle. Public Corruption is a grave and profound threat to a Democracy. Government corruption spreads outward, like a cancer, and infects the operations of government itself. If the corruption is not removed, then the people are not able to have faith in their government. It deadens and saps the spirit of civic participation. Corruption decays our trust in institutions and our legal system. When the outcome is fixed, when the system is rigged, people lose hope. They detach. Our society becomes unplugged and unhinged. When the powerful can get away with anything, because they have the money and the connections to rig the system, then the laws lose their moral authority. Hillary believes money and power – not truth and justice – should rule the day. As FDR once said, government by organized money is just as dangerous as government by organized mob. This is what we often see in Third World countries – where the governments are often run by a small handful of corrupt people for their personal enrichment. Corruption is corrosive to every institution of government, and it must be stopped. Restoring honesty to our government, and the rule of law to our society, will be my highest priority as President. We must save the America. That is why My Contract With The American Voter begins with a plan to end government corruption and take our country back from the special interests. I want the entire corrupt Washington establishment to hear and to heed the words I am about to say. When we win on November 8th, We Are Going To Washington, D.C. And We Are Going To DRAIN THE SWAMP. This entry was posted in Donald Trump, Election 2016, media bias, Uncategorized, White House Coverup. Bookmark the permalink. The Drain the Swamp graphic is very effective and I can use this on my FB posts and in emails. The graphic nicely sums us this very focused and vote moving speech. Donald Trump may speak unwisely from time to time but that tells us that he means what he says and says what he means. That is unusual and a model for us all. I am voting for the candidate who is not a two faced, double talking lying opportunist who uses political power for personal profit who thinks the European Welfare State Model. I am voting for the patriotic American candidate who believes in American Exceptionalism and the Rule of Law. Sundance provides us the tools needed to spread truth and wisdom far and wide. I am so deeply grateful of his, and the CTH community’s willingness to share. Hillary didnt have a chance with Sundance and us spreading the word. The whole CTH crew played a big part in this election. Thanks to all of you. It’s not over – let’s finish strong – no letting up! Your right! Its not over yet. Im going to keep campaigning untill its called on the 8th. Godspeed Mr. Trump Mr President, and fare well. You have united a seemingly adrift and disparate populace behind you in common cause and purpose. It takes unimaginable courage to take on the alligators and venomous snakes that abound in the Democrat/GOPe NWO Globalist Uniparty Swamp, and out of a population of 300+ million Americans only Mr. Trump had the guts to step forward to Drain that Swamp!!! October 29, 2016 at 8:34 pm) above, the history books of this campaign will be quite fascinating reading for many years, including the appendices for this site and what the people of this site put out. The image is obviously a short summary of the guns aiming at DJT. We are his shield. Let his enemies beware. Click on the image and it will open a larger version on another page. A thousand and one thank you’s. You left out Fox News! I didn’t see the RNC in that picture. I was wondering where the RNC really stands right now on supporting and funding Trump, as well as the Trump Make America Great Again Committee (TMAGAC at donate.donaldjtrump.com, which gives at least 20% of contributions to the RNC). 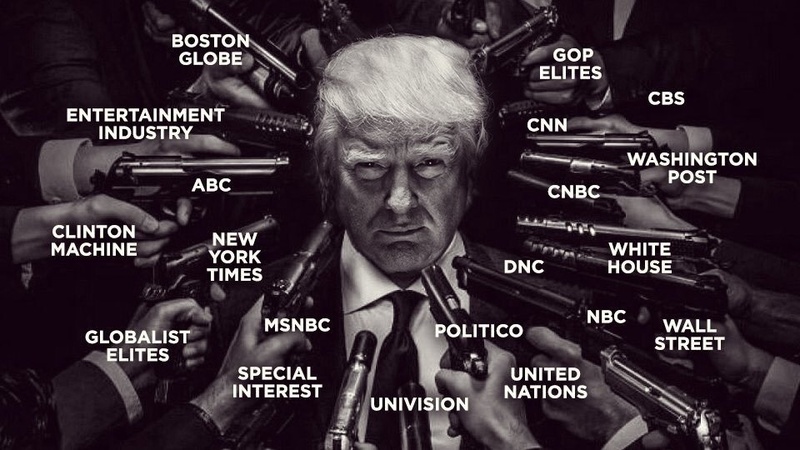 “We are going to Washington…to drain the swamp!” I hereby nominate Donald J. Trump for “world’s most courageous man”. Part of what keeps Mr. Trump safe is not only that millions upon millions of us support him and stand behind him, but that we do so fervently! TPTB need to know that if they mess with Trump, we are coming for them. I wonder, does it not make Hillary a bit nervous to hear 30,000 people chant “lock her up!”… at every big rally? Excellent speech. And fantastic graphic to go along with the description. Golden Colorado is full of liberals and independents. I’m so glad that Trump had an overflow crowd. This was on the doorstep of sanctuary city Denver. Jan. 20 and the Federal Subsidy for sanctuary cities will be done. Don’t think there were may liberals there. You have to be willing to stand up for 6 hours plus to attend and that pretty much excludes liberals. I watch this live on CNN at home. I have NEVER watched cnn at home in the last 10 years or so. Best Saturday ever. This guy has my vote. He is the ONLY candidate I have EVER heard talk so refreshingly honest about how corrupt the entire government is and has been. He is the epitomy of the outsider candidate and why it is so important that he be elected–to solve the very thing that no politician ever could. I only hope there are enough septic trucks available to #DrainThe Swamp. There will be, ahead of schedule and under budget. Don’t the Snakes in the swamp have to VOTE to Term limit themselves? Can’t see that happening! Would think there would be something WE THE PEOPLE can do to change that! Goodness, I love this man !!! As it turns out, he is a man of a great destiny. Thank you Father for raising up Donald Trump for this time in history. You knew we would need Mr.Trump and You delivered him in answer to our cries and prayers. Please remain with him throughout this dangerous time and throughout his 8 years in office. Amen. At the start of this election cycle I started researching candidates, since I’ve been a state delegate the past couple election cycles and figured I would be again. There were things niggling at the edges of my consciousness that made me uncomfortable about the GOP field, but that were hard to put together. Then, I came across this website, which I hadn’t seen before. Somehow ran across the list of articles detailing things Sundance had put together – the same things I’d been seeing. And it all came into focus. And I knew why I felt so distrustful of the GOP field. With two exceptions: Dr. Ben Carson and, to my surprise as I looked into his background, Donald Trump. Carson was great but didn’t have the experience and wasn’t getting the votes. But the more I looked at Trump, the more I liked him. I did become a state delegate, and bucked party Cruzbot leadership to vote Trump (yes, I’m in Colorado, THAT state), and now feel nothing but satisfaction as I see this election play out. A few more days to go, and praying and trusting in God. But want to say thanks to Sundance and crew for showing how all the pieces fit together. And I’ve turned others on to you, too! And some people say that Trump should let Hillary off the hook or that he won’t do anything to hold her accountable for her crimes! SNORT! Look, Trump either does what he says he’s going to do, or we’re all screwed. And as far as Hillary skating again, I firmly believe that someone somewhere WILL find a way to imprison Hillary and Co.–even if Obama pardons her. I believe in you Mr. Trump and so dose my whole family. GO TRUMP GO.